﻿The applet below contains a quadrilateral that ALWAYS remains a KITE. 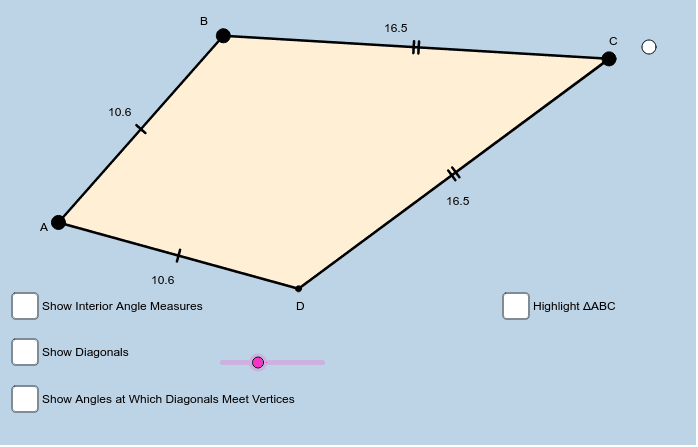 The purpose of this applet is to help you understand many of the geometric properties a KITE has. The questions you need to answer are displayed below this applet. Be sure to frequently change the locations of points A, B, and C to create different kites before making any general conclusions. Be sure to also use the pink slider to adjust the size of angle A. Use this template to complete the investigation questions in the activity given to you at the beginning of class!